Check out the links below to play other variations of Pac-Man online ! Pac-Man, or PAC-MAN as it is styled graphically, is an arcade game classic designed by Toru Iwatani. Namco first released the game in Japan in May 1980. It was later licensed for distribution in the USA by Midway Games in October 1980. 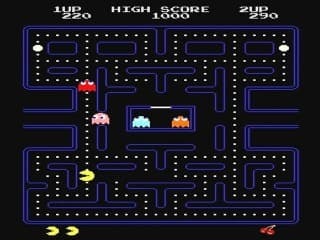 Ms.Pac-Man was released in the United States in February 1982 and went on to become one of the most popular arcade games in history. Use the arrow keys to move Pac-Man or Ms.Pac-Man. Avoid and kill the ghosts and eat all the pellets to complete a level. 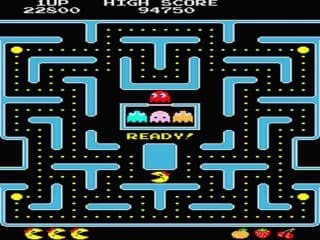 There are 4 big pellets on each level that Pac-Man or Ms.Pac-Man can eat that allows the ghosts to be eaten. But be quick, because you only have a short amount of time, and with each level you clear, the less and less time you will get. Extra lives are awarded at 10,000 points and then every 20,000 points. 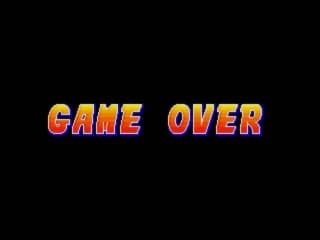 On Ms.Pac-Man extra lives may also be awarded after cut scenes which occur every 2-3 levels. You can also collect fruit during the game for extra points.